From Kaisilver, The World's Largest Online Provider Of High End Jewelry And Gemstones, Custom Made. 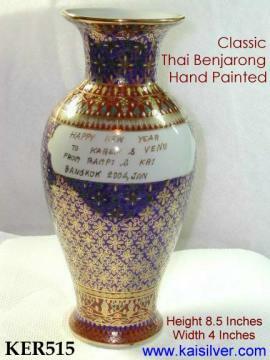 The Most Popular Form Of Ceramic Painted Pottery From Thailand Is The Benjarond. With A Rich History That Dates Back To The Palaces Of Kings And Queens, Thai Ceramic Painted Benjarong Pottery Is A Spectacular Display Of The Mastery Of Skilled Artisans. 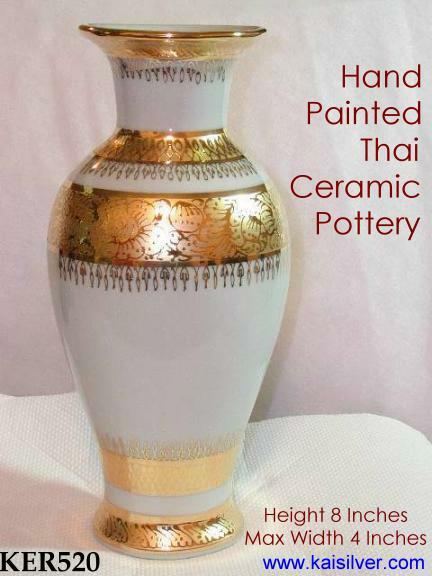 Kaisilver Adds To The Beauty Of These Painted Ceramic Thai Pottery By Providing Customization And Personalization For Even Single Piece Orders. These Gorgeous Benjarong Thai Ceramic Pottery Make Perfect Ceramic Gifts For Mother's Day, Birthday Gifts, Valentine's Gifts, Wedding Gifts And Any Other Occassion. 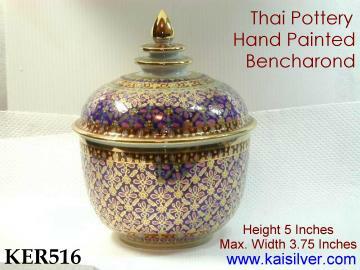 Kaisilver Provides Customisation Of Thai Ceramic Hand Painted Pottery Like Never Before. Browse Our Collection Of Thai Benjaron Ceramics, Select The Shape And Design Of Your Choice, Then Select The Design. Now Leave It To Our Craftsmen To Create The Perfect Bencharon Hand Painted Ceramic Pottery, Custom Made For You. You Can Even Personalize Your Bencharoan With A Personalized Message. What Is More Surprising Is That We Provide Complete Customization Even For Single Piece Orders. From The Palaces And Royal Ceremonies Of Ancient Thailand, Kaisilver Has Taken The Richness And Beauty Of Benjaron Painted Ceramics Right To Your Doorstep. Customized With Your Choice Of Shapes, Sizes And Designs And Further Enhanced By Your Own Personalised Message. Good Benjaron Ceramic Pottery From Thailand Can Be Made In Just One Way, And That Method Is Very Time Consuming. Individual Attention Is Required For Every Piece From Skilled Craftsmen And Artisans. Shortcuts And Compromises Will Show Up As Defects In The Long Term And Your, Wonderful Handpainted Benjarong From Thailand Could Soon Become A Piece Of Faded Glory. From The Outside, All Benjarong Looks The Same. Like Good Jewelry, You Need To Value The Seller Before You Can Trust The Quality Of Merchandise. Click Here For More Details Kaisilver Custom Makes Your Thai Ceramic Benjarong Pottery The Way They Were Supposed To Be Made. Carefully Handled By Some Of The Best Artisans In The Country. Coupled With The Strictest Quality Control Checks, We Ensure That Only The Best Benjarond Painted Pottery Is Released For Shipment. Defective Merchandise Is Discarded At The Very Stage Where The Problem Or Defect Is Noticed. No Attempt Is Made To Cover Up Defects Or Even Recycle Rejects. As The World's Largest Provider Of Online High End Custom Jewelry We Know The True Meaning Of Custom Made Merchandise. Our Thai Ceramic Creations Are Made With The Strictest Quality Standards, These Are True High End Benjarond Painted Pottery. You Choose The Shape And Size That Suits You, Then Select Any Design From The Website. Go A Step Further And Personalise Your Thai Ceramic Bencharond With Your Message. Our Skilled Craftsmen And Artists Will Create An Exclusive Piece Just For You. Click Here For More Details Kaisilver Is The Only Provider To Do Full Customization Even For Single Piece Orders, Our Experience And Expertise In Custom Jewelry Making Has Given Us A Solid Advantage When It Comes To Customization And Personalisation. The KER520 Thai Ceramic Benjarong Pottery Sells For Just 200 U.S$. This Is A Very Simple And Elegant Design And Can Also Be Created On A Bencharond Thai Ceramic Bowl Instead Of A Vase. The KER516 Thai Ceramic Benjarong Pottery Sells For Just 150 U.S$. This Bencharond Piece Can Also Be Created In Size Of 8.5 Inches And Is Then Priced At Just 250 U.S$. The KER513 Thai Ceramic Benjarong Bowl Is Priced At Just 250 U.S$. This Is The Big 8.5 Inch Benjarong Bowl. The KER513 Bencharond Piece Can Also Be Created In Size Of 5 Inches And Is Then Priced At 150 U.S$. The KER515 Ceramic Thai Bencharong Vase Is Priced At Just 250 U.S$. You Select The Shape And Design For Your Thai Benjarong Pottery. Any Combination Is Possible As Every Piece Is Custom Made. 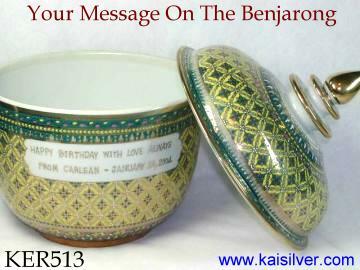 Add 50 U.S$ In Case You Need Any Personalised Message To Be Painted On The Benjarong That You Order. Choose Your Font For The Customized Message. Shipping Is 50 U.S$ Per Piece. If You Buy More Than One Piece, Ask Us For Special Shipping Rates. We Bear All Risks Associated With Shipping And Transit. Any Damaged Or Broken Pieces Will Be Replaced At No Additional Charge. The Parcels Are Shipped From Thailand And We Will Provide You The Tracking Number When Shipped. Since Every Piece Is Completely Hand Made And Hand Painted Slight Difference In Designs May Occur As It Is Virtually Impossible To Make Exact Replicas. Shipping Will Be Within 3 To 4 Weeks Of Order Confirmation And Receipt Of Payment. You Should Receive Your Merchandise In 4 To 5 Working Days After That. For Payment We Accept Paypal And Money Orders In U.S$. Our Email For Paypal Is info@kaisilver.com You Can Register Free For Paypal At www.paypal.com Also, Read About Why We Prefer Paypal Payments. Consider The Safety And Privacy Factors Detailed In Our Report At http://www.kaisilver.com/paypal01.htm Let Us Know If You Have Another Choice Of Payment Method And We Will Try Our Best To Help You. Browse The Entire Website And Note Down The Item Number Of The Benjarong Pottery Shape And Size That Interests You, Then Have A Close Look At The Designs Hand Painted On The Benjarong And Note Down The Item Number For The Design. All Combinations Are Possible As Our Artisans Will Actually Custom Make A Unique Piece For You. Remember That Customization Is Available Even For Single Piece Orders. You Can Even Personalize Your Thai Benjarong Vase Or Bowl With A Message. If You Need A Custom Message Painted On Your Thai Ceramic Benjaron Gift. Keep The Message At Around 15 To 20 Words Split Into 2 Lines. This Is Fine With Ceramics That Are At Least 8 Inches High. For The Pottery That Is Around 5 Inches High Limit Your Text To 8 To 10 Words Split Into 2 Lines. This Customized Message Will Be Painted In Gold Color On The Benjarong Ceramic Pottery And Will Be A Part Of The Design. Incase You Need To Select A Font For Your Personalized Message See The List Of Fonts Available. Click For Font Options Email Us The Above Details At sales@kaisilver.com We Will Get Back To You Very Soon And Provide All Details For The Benjaron Ceramic Pottery From Thailand. Kaisilver Will Then Create The Most Spectacular Custom Made Bencharon Ceramic Gift Pottery For You, Along With Your Personalized Message. Complete Customization Is Possible Even For Single Piece Orders. You Really Do Not Need To Place Bulk Orders To Have Your Bencharon Ceramic Pottery Customized. !!! F R E E !!! The Only Professional Jewelry And Gemstone Newsletter In Simple Non Technical Language. Stay Updated With The Latest Developments And Information. We Provide Frank, Honest And Straightforward Advice And Suggestions. Kaisilver Is The Only Newsletter Where Profit Margins And Sales Talk Take A Back Seat. The Emphasis Is On You And How To Get The Best Value For Your Hard Earned Money. Your E-mail Address Is Kept Confidential. We Do Not SPAM Or Sell Your Personal Details. The kaisilver Mailing List Is Maintained And Checked By Bravenet.Org. Each E-mail Address Is Inserted Into The Mailing List Only After A Double Confirmation Is Received From You. Enter Your Details In The Box Below, You Will Be Added To The List Only After You Re-confirm To Join The List. The Re-confirmation E-mail Will Come To You Directly From Bravenet. Your E-mail Address Will Be Released By Bravenet To Kaisilver Only After You Reply To The E-mail That You Receive From Bravenet.